You don’t have to go out to enjoy Valentine’s Day with your loved one. Sometimes the best Valentine’s Day is a Valentine’s Night In, cosying up and enjoying each other’s company. Here are a few ideas to make the most of a romantic evening (not just limited to Valentine’s Day). Even if you don’t cook for yourself all the time, making a homemade meal is easy. If you’re not confident, there are some easy options for food you can throw together and cook in a matter of minutes. If you want to work it into the evening’s activities, you could even have fun cooking something more complex together. Just remember the aim is to have fun, not get frustrated. Try some of those recipes, or look up your own to try out. Cooking made at home always tastes better when you know the work that’s gone into it, and you won’t be waiting ages for a table or a takeaway. Light some candles, open a nice bottle of wine and have a great dinner together. Whatever your feelings about flowers as a Valentine’s Day gift, they make a great addition to the décor for your romantic night in. Prepare some nice vases or even just some tall glasses and add a little colour to the room with fresh flowers. You can also consider using different throws and blankets for your furniture, perhaps specially bought for the occasion or just covers you don’t normally get to use. It doesn’t have to be pink and covered in hearts, just something that looks nice and makes the evening different from the usual. Candles are great for dinner, but you might also consider turning the lights off and using candles to set the mood. Even tealights and plain white candles work for this; the atmosphere of a candlelit room is great no matter what candles you’re using. Whatever you do, make sure you plan ahead. For cooking and decorating that’s obvious, but it goes for planning the evening’s activity too. Figure out what movies you’re going to watch, which games you’re playing, where your romantic stroll will take you, whatever your plan is. Otherwise you risk spending more time figuring out what you’re doing on the night than actually doing it. It also means you have something to look forward to and get excited about. Think about the little things, too. Planning on having white wine or champagne? Having an ice bucket will help you keep it cool all evening. Get hold of a bucket you can use and prepare some ice cubes in the freezer ahead of time. For movies and TV series, make sure you have it ready, don’t just assume it’ll be on Netflix. If you’re cooking, some things are better to prepare ahead of time to make the process itself much less frustrating. Put some thought into it all. Think about turning off your phones and forgetting about the internet and social media for the evening. 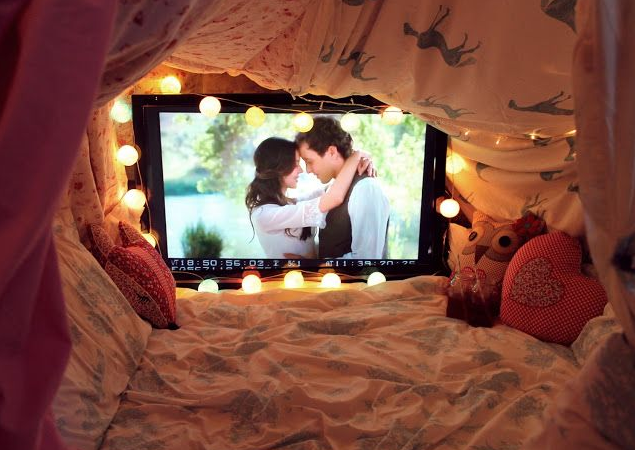 You want to spend it together, not staring at Facebook. Agree to turn your phones off or even just leave them in another room altogether. It’ll make a big difference. Finally, remember that the idea of Valentine’s day is to enjoy life with your partner. No matter what you have planned, just make sure that you let yourself relax and have fun. It’s an evening to be enjoyed, even if not everything goes to plan. Don’t stress. Enjoy an evening where you don’t have to worry about anything else.